Blog » Sage Accounting » So then, what exactly is ‘cloud-based software’? So then, what exactly is ‘cloud-based software’? Here in the Sage One team, we love ‘the cloud’. Our Sage One Accounts and Payroll software is all hosted online meaning that instead of installing software on your machine, you access it all online via your web browser. However, we appreciate that many people still aren’t sure what is actually meant by ‘cloud-based software’ so we’ve produced a short guide which helps you understand how you and your business can benefit from this new way of flexible working. 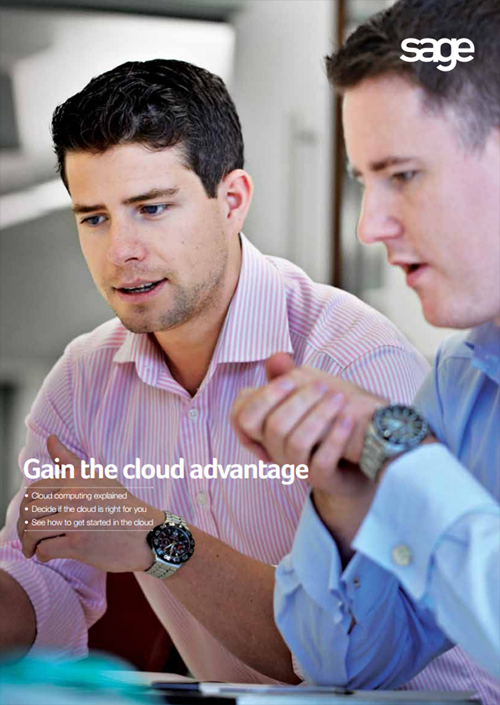 Click on the image below to download our free ‘Gain the cloud advantage’ guide .PDF. If you’re starting or growing a small business, take a look at our cloud-based Sage One Cashbook, Accounts and Payroll software and sign up for a FREE 30 day trial by clicking on the buttons below.